I love, and always will love, making healthy baked French fries at home. But these days, I’ve been switching out the potatoes for carrots. And I’m loving them even more than the traditional kind. 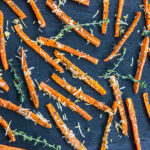 It only takes a few ingredients to transform bland carrots to something addictive and amazing tasting! My personal opinion after enjoying these fries: people only think they don’t like veggies because, so often, they’re served plain (just simply steamed or boiled). What these fries aren’t: crispy on the outside, like they would be if you’d covered them in batter and put them in a deep fryer. What they are: very healthy and extremely addictive and yummy! The herbs, garlic, and parmesan make these fries so flavorful. And yet they’re light and packed with nutrition. My new goal: make every veggie side dish taste this good! Arrange the carrot strips on a parchment-lined baking sheet so that no two are overlapping. Using a basting brush, coat the tops of each strip with the olive oil. Sprinkle the thyme and garlic over the fries. Season with salt and pepper. Cook the fries about 10-12 minutes, or until the fries are easily pierced with a fork. Immediately after removing from the oven, sprinkle the fries with parmesan. Serve. Very interesting idea – those actually look really good and a great way to eat more carrots! …and I think that’s a great new mission! So if they’re not crispy, do you eat them with a fork? In any case, I’ll definitely try these. I’m always looking for ways to get more veggies into my meat-and-potatoes-guy. He definitely won’t eat them if they aren’t delicious. Ha, well I eat them with a fork and Meat-and-Potatoes-Guy uses his hands – so either way works. Enjoy! This looks like a really tasty and healthy side dish! I love carrots, so I know I’d enjoy these a lot. 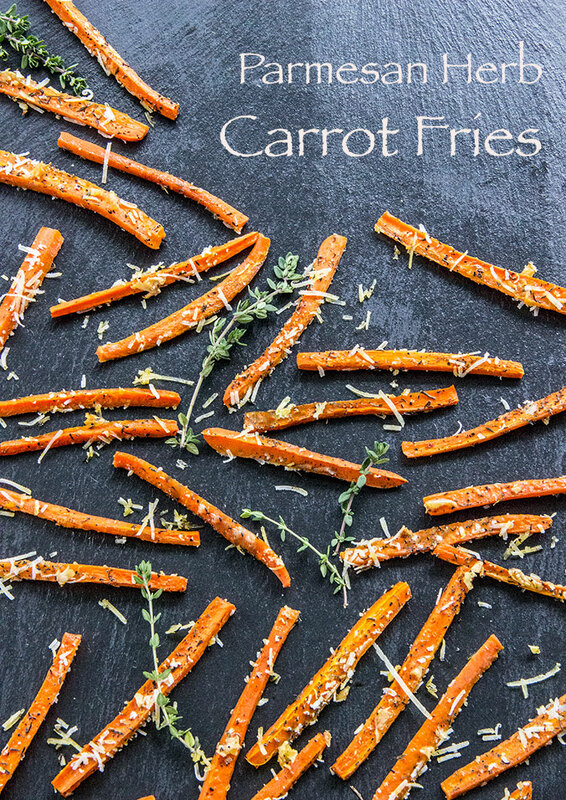 Carrots are a daily snack for me so I’m loving these fries! OoOooooooh these look SO amazing! I may need to give this a tryyy! I can smell the fries … all the way up here. Great idea .. never thougth of .. and very healthy too. I’m all into healthy stuff so long as it taste good. Today I used melted butter and grated parmesan in my plain rice … fantastic!!! Good luck with your mission I know it will be no problems what so ever for … my little chef. Lovely alternative to fries. I always substitute fries with sweet potato fries when eating out..the sweet taste is so addictive. I bet the carrot fries have this slightly sweet taste too! 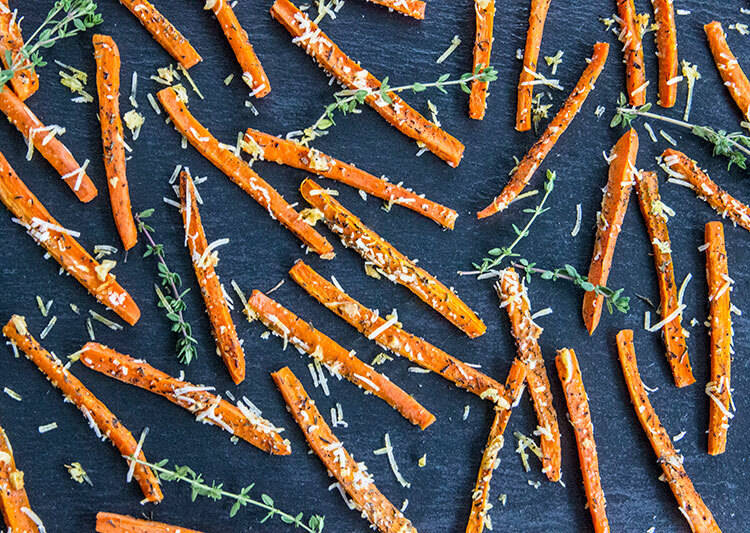 Totally loving these healthy carrot fries–so creative! Pingback: Fit Girl's Diary You can do it with sweet potatoes, carrots, zucchini, or even with beets. And you know what? They taste even better than the one you can buy in the store. So here are my ideas for healthy chips.